The penalty for not delivering on this expectation for relevance and consistency of communication and engagement is getting greater every day. If you don’t use the insight collected effectively, you will lose the customer. We live in a world with more channels, customer touch points and banking options than ever. Consumers are being overwhelmed with messages on traditional media and on digital/social channels in new and different ways every second of the day. Consumers want simple messages that are directed specifically to them as opposed to a mass audience. In the Salesforce report, “State of the Connected Customer,” it was found that 81% of consumers expect the same level of service whenever they interact with a company across different channels. The report concludes that AI can help organizations create consistency and a personalized experience across channels over time. According to Ben Lamm, Co-founder and CEO, Conversable, the old ‘Rule of Seven’ (the number of times a message must be heard for a consumer to take action) has increased to 10 or even as high as 30. The reality is that it is harder than ever to get (and keep) a consumer’s attention. This has increased the need to expose consumers through digital and social channels. This is where AI becomes important in marketing. 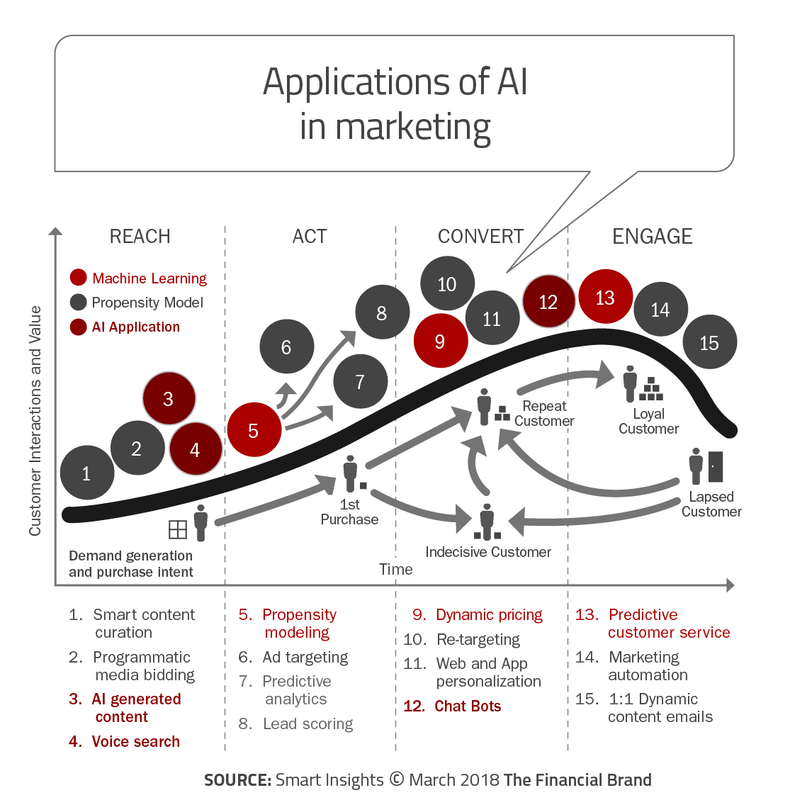 With the assistance of AI and machine learning, financial marketers are being challenged to connect activity and behavioral inputs with consumer-centric outputs. The inputs can be transaction history, website inquiries, social media interactions, or any other way we can collect insights on specific customers and members. With machine learning, the data is analyzed with advanced algorithms to better understand the intent of the inputs and to provide personalized and real-time outputs (messages). Most marketers believe using AI for media buying is one of the strongest use cases. Marketers believe AI can improve targeting and personalization for media placements thereby helping decrease the level of frequency required. According to Salesforce’s report, 60% of marketers believe AI will have a “substantial or transformational” impact on their business’ programmatic and media buying in the next 5 years. There is also a strong case made for AI and machine learning helping to make marketers more efficient and effective, allowing for more strategic engagement. In a Forrester survey, 79% of marketers thought AI would allow them to move toward more strategic work. It doesn’t do any good if the talk about AI and machine learning in marketing is just theory, hype or if the technology can’t be implemented at organizations of all sizes. To help navigate the capabilities of AI and behavioral marketing across the customer lifecycle, Smart Insights provides a great infographic identifying fifteen artificial intelligence techniques that organizations of all sizes can implement. Reach is the initial stage of the buyer’s journey. The key is to attract more visitors and provide an engaging experience that will lead to a purchase. 1. Smart Content Curation: This stage is about showing visitors content relevant to them based on what others like the prospect have bought in the past. In short, this can be a form of recommendation engine that includes products, offers and content. 2. Programmatic Media Buying: This relates to the use of propensity models to more effectively target ads to the most relevant customers. AI can help by determining the best (and worst) sites to be used for ads. 3. AI Generated Content: AI content writing programs can select elements from a dataset and structure a ‘human sounding’ article that is personalized to a specific prospect. For banks and credit unions, AI writers can assist with quarterly earnings reports and market data. 4. Voice Search: To improve reach, voice technology driven by AI is about utilizing the technology developed by the major players (Google, Amazon, Apple) to help increase organic search traffic using digital personal assistants. The second stage of the consumer journey is intended to draw the consumer in and to make them aware of your products and services. 5. Propensity Modeling: Propensity modeling uses large amounts of historical data to make predictions about the real world. Machine learning at this stage helps to direct consumers to the right messages and locations on you website as well as to generate outbound personalized content. 6. Ad Targeting: Propensity models can process vast amounts of historical data to determine ads that perform best on specific people and at specific stages in the buying process. This allows for more effective ad placement and content than traditional methods. 7. Predictive Analytics: Using propensity models can help determine the likelihood of a given customer to convert, predicting what price a consumer is likely to convert, or which customers are most likely to make repeat purchases. The key here is accurate data. 8. Lead Scoring: Scoring leads is the process of using predictive analytics so that a sales team can establish how ‘hot’ a given lead is, and if they are worth devoting time to. This is the important stage of moving a consumer from being an interested prospect to being a customer or member. 9. Dynamic Pricing: Dynamic pricing uses machine learning to develop special offers only for those prospects likely to need them in order to convert. This means you can increase sales without reducing your profit margins by much, therefore maximizing profits. 10. Re-Targeting: Propensity models can help determine what content is most likely to bring customers back to your site based on historical data. This optimizes re-targeting ads to make them as effective as possible. 11. Web & App Personalization: A very powerful tool, you can use propensity models to personalize a web page or app based on where the consumer is in their journey to purchase. 12. Chatbots: Chatbots use AI to mimic human intelligence, interpreting consumer inquiries and completing orders. If you are interested in building a chatbot for your brand within the Messenger platform, Facebook has created instructions for how to do so. Once a purchase is made, it is important to continuously build engagement and loyalty with the intention of expanding the relationship and potentially generating referral business. 13. Predictive Customer Service: Predictive analytics driven by machine learning can be used to determine which customers are most likely to either become dormant or leave altogether. With this insight, you can reach out to these customers with offers, prompts or assistance to prevent them from churning. 14. Marketing Automation: Machine learning can and predictive analytics can be used to determine the best times to make contact with a customer, what words should be used in the communication and much more. These insights can improve the effectiveness of your marketing automation efforts. 15. 1:1 Dynamic Emails: Predictive analytics using a propensity model can use previous behavior to promote the most relevant products and services in email communication as part of the onboarding process. The results from these communications are then fed into the models to improve results in the future. A survey from Brightedge asked 8 eight key questions related to the future of marketing and topics centered around the challenges, solutions, and adoption of Artificial Intelligence (AI). The findings confirm the importance of machine learning and AI for the future of marketing. When asked about the ‘next big trend’ in marketing, survey respondents saw personalization (29%), artificial intelligence (26%) and voice search (21%) as the top three trends for the future. All of these trends relate to the application of artificial intelligence and machine learning. As expected, the expectation of using advanced technology in marketing far surpassed actual usage or even expected usage. This may be caused by the mystery surrounding how to effectively leverage these technologies as well as the perception that the cost or need for new talent to leverage these technologies are too high. 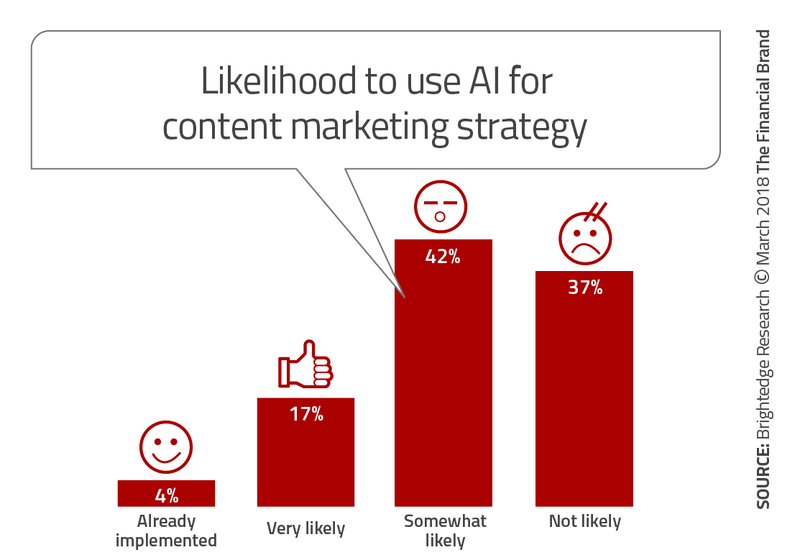 In the Brightedge survey, only 4% of the surveyed marketers wee currently using AI for content marketing, while a total of 59% were either ‘very likely’ or ‘somewhat likely’ to deliver content marketing solutions. When survey respondents were asked how important AI was for achieving their goals, 47% of marketers believed AI would help, but was not ‘mission critical, while 36% believed AI to be a ‘luxury’. This is a concern given the need to respond to consumer expectations of improved targeting, more personalized communication and real-time engagement. Despite the potential for AI and machine learning, there are a number of obstacles to successful utilization of these advanced technologies in marketing. Beyond, budgets, data integration, analytics and other internal issues, probably the most significant obstacle over the next 5 years will be in skills required. AI is allowing marketers to make better decisions – quicker and at a lower cost than ever thought possible. “Better decisions are why marketers get ahead and why they get promoted to higher levels of responsibility,” states the BrightEdge research report. It is more important than ever for financial marketers to become part of the AI and machine learning revolution. Related News from The Financial Brand!